For a few weeks in September and October the school hall was constantly busy. Sets were built, choruses rehearsed and those few not directly involved studied. Being a bit of a Muso I was very impressed that they had a live band for the production, especially for the fairly tricky music of West Side Story. I tried to paint this from life at the show itself but the stage lights were only up for a few days and in the end this is a composite of photos, drawings and oil sketches. 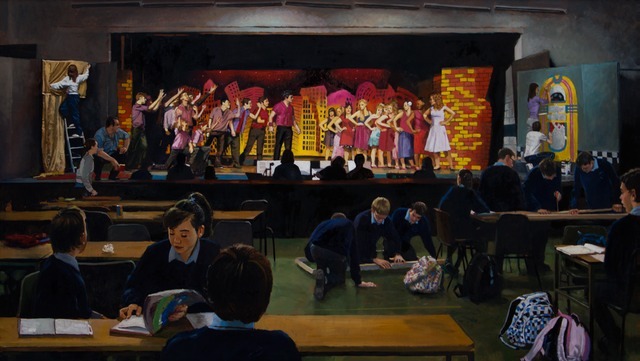 However as a result it collapses a whole month of activity into one image, although this is a fair approximation of the school hall in October, with people painting and building sets, the cast rehearsing, the director directing and the band playing on.